An excerpt from a 1978 Radio 4 Epilogue presented by H. Colin Davis, on the subject of Youth. 'O star-shine on the fields of long ago' composed by Barry Rose, and sung by Alan Byers (tenor), with the composer at the piano. Closing signature tune also arranged and accompanied by Barry Rose, with the 'cellist, Martin Elmitt. Great Lord of Lords (Orlando Gibbons) Canterbury Cathedral Choir, filmed in the Cathedral, 1986. Since the mid 1920’s, the BBC had appointed a Music Adviser to the Head of Religious Broadcasting. The first holder of the part-time post was Henry Walford Davies, formerly organist and choirmaster at London’s Temple Church, and later, Master of the King’s Musick. On his death, in 1941, he was succeeded by George Thalben Ball, also organist and choirmaster of the Temple Church since 1921. 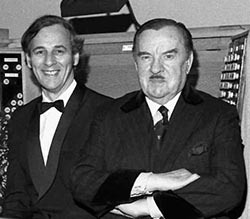 GTB, as he was known, had retired from the BBC post in the late 1960’s, and it was through John Poole (the musical director of the BBC Singers) that Barry Rose’s name was put forward as his successor. Click here to see larger photo of George Thalben Ball and Barry Rose, at the console of the Compton organ in the Concert Hall (now the BBC Radio Theatre) at Broadcasting House, London, in 1975. (sadly, the organ console was removed some years later, though the pipework is still intact, behind the original facade). The appointment was confirmed in October, 1970, and Barry began his duties at the beginning of 1971 – his first assignment being to play the organ in a live broadcast of an Epiphany Eucharist, from St.James’ Church, Piccadilly, London, featuring the jazz-setting of the Mass by John Dankworth, who was there in that morning in the congregation (it was a happy coincidence that both John Dankworth and Barry Rose had attended the same school – Sir George Monoux Grammar School – in Walthamstow, East London). Initially, Barry’s BBC duties consisted of directing the music at the Radio 4 Daily Service – then broadcast on all six weekdays - and preparing detailed written critiques of the weekly live broadcast of Choral Evensong, from the UK’s Cathedrals, greater churches, and Collegiate Chapels. On the retirement of the producer of Choral Evensong, the Reverend Prebendary W.D. Kennedy-Bell, the responsibility for selection of these venues, and the production of many of the weekly broadcasts, passed to Barry, and in his 20 years at the Corporation, he was a regular visitor to many of the venues, as producer, closely working with many of his Cathedral organist colleagues. He claims to be the only person to have sung in (Hampstead Parish Church), played the organ (London churches, with the BBC Singers), directed the choir (Guildford, St.Paul’s, and St.Albans Cathedrals), and produced the programme (many UK venues, and a few in Europe & USA), as well as editing the whole series! Barry also advised on and usually provided the music for the weekly Epilogue broadcasts, working closely with John Poole and the BBC Singers. He arranged and performed several of the opening and closing signature tunes, as well as writing signature tunes for other Radio series – including Priestland’s Progress, The Case against God, and Ten to Ten. He also contributed original compositions, and in 1982, was commissioned to set the BBC’s motto to music for the Corporation’s 60th Anniversary Service in St.Paul’s Cathedral. With Ian Macintyre, the Controller of Radio 3, he instituted the now regular annual broadcast of the annual Advent Carol Service from St.John’s College, Cambridge, (click here to listen to one of the carols in that very first broadcast), and also oversaw the second weekly broadcast of Choral Evensong, firstly on Fridays, and later, on Sunday evenings, which ran for a few years, usually recorded, but occasionally live. During 1986/7 he wrote and presented the television series Close Harmony, featuring the choirs of Canterbury, Christ Church (Oxford) and Worcester Cathedrals, together with King’s College, Cambridge. He officially ‘retired’ from the BBC in 1990, but since then, has continued to take an active part in directing the music in the Daily Services, initially from All Souls Church, Langham Place, and, for the past 10 years, from Emmanuel Church, Didsbury, Manchester.